Paul Shorrock | Illustrator | The Rich Picture of Rich Pictures. The Rich Picture of Rich Pictures. 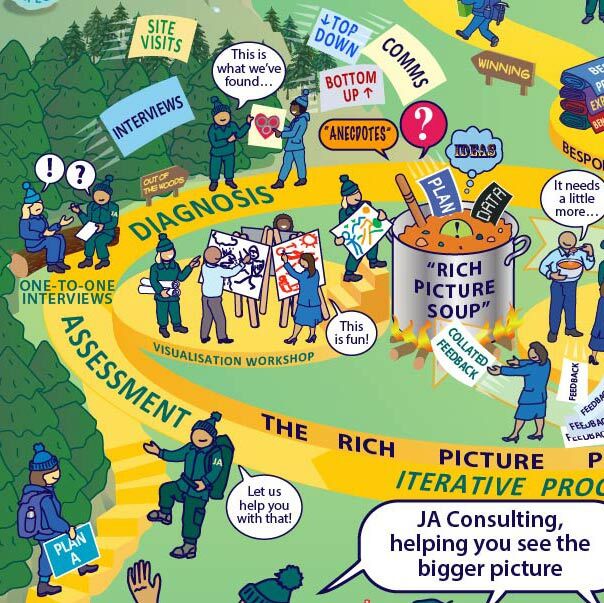 The smart people at JA Consulting have really bought into the benefits of Rich Pictures and wanted a way to show the way they can support a variety of business outcomes. A Rich Picture to explain Rich Pictures was the obvious way to go. JA Consulting are a bespoke consultancy with an impressive track record. They first approached me in early 2017 because they had seen and liked a picture I had done for the The Royal Navy. Since then I have worked with them on several projects and I have always been impressed by their intelligence, their rigour and the simple fact they do what they say they are going to do. Added to that they heap flattery on me, introducing me to their clients as “our Rich Picture genius” or “our visualisation guru”! They outlined their initial ideas for the picture, with the “JA Triumvirate” of an Analyst, a Visualiser and a Facilitator as mountain guides, helping Clients over the hump of business change. This immediately reminded me of the very first Rich Picture I did back in 2006. I showed them this first picture and that became the starting point for “The Rich Picture of Rich Pictures”. I asked them at the outset if I could use the finished image on my website and they readily agreed. The finished result is effectively shop window for my work, as well as a way for JA Consulting to show off our combined capabilities. As I rarely get to show off my Rich Pictures in full due to client confidentiality issues I was glad of the opportunity. Rich Picture for Atos, 2006. 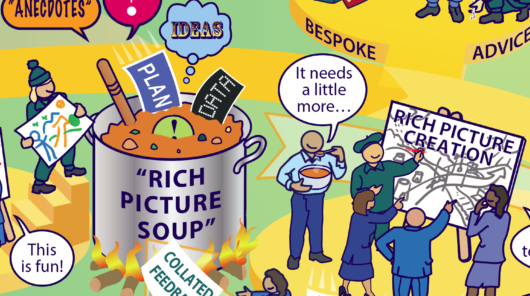 Using the very first Rich Picture I ever made as the starting point seemed apposite and allowed us to hit the ground running with a workable “meta-metaphor”. I also lifted ideas from some of the subsequent sixty-plus pictures I’ve done since then. I requested that JAC acted like a demanding client, even if the fee negotiated was a fraction of the norm, so that the quality was as good as possible and they were good to their word. There were four pencil iterations and some very fine nit-picking along the way, which is how it should be. There is also the understanding that the picture will be improved throughout its useful life. 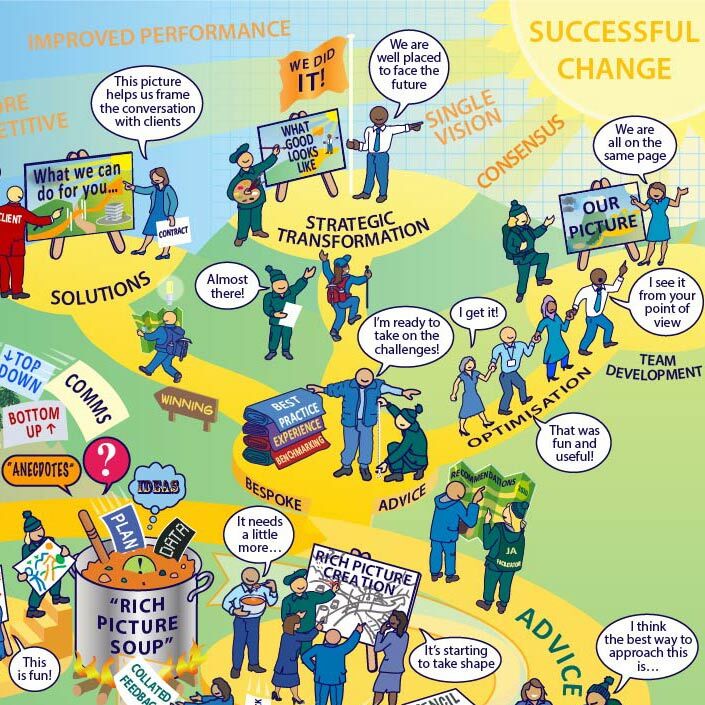 There are many reasons you might want a Rich Picture but for simplicity we reduced this down to three main categories, 1, Strategic Transformation (Change comes under this umbrella), communicating a future vision, recognising the need for change, outlining the path towards the sunlit uplands of the future state. 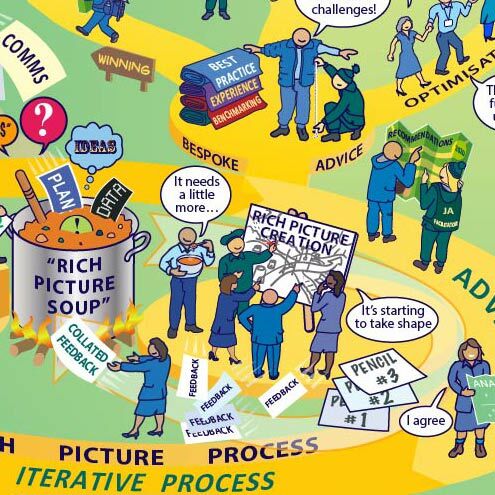 2, Solutions (this includes bids for new business or outlining a business offering); more and more clients are including a Rich Picture as part of a bid-process believing it helps frame the conversation and is much more effective at getting a message to stick than yet another PowerPoint presentation. 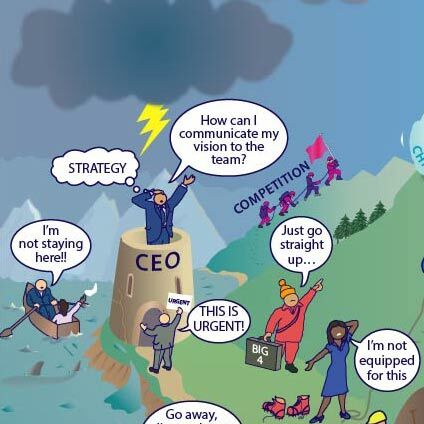 3, Team Development, a Rich Picture can be a powerful tool for getting clarity and alignment across a diverse organisation. 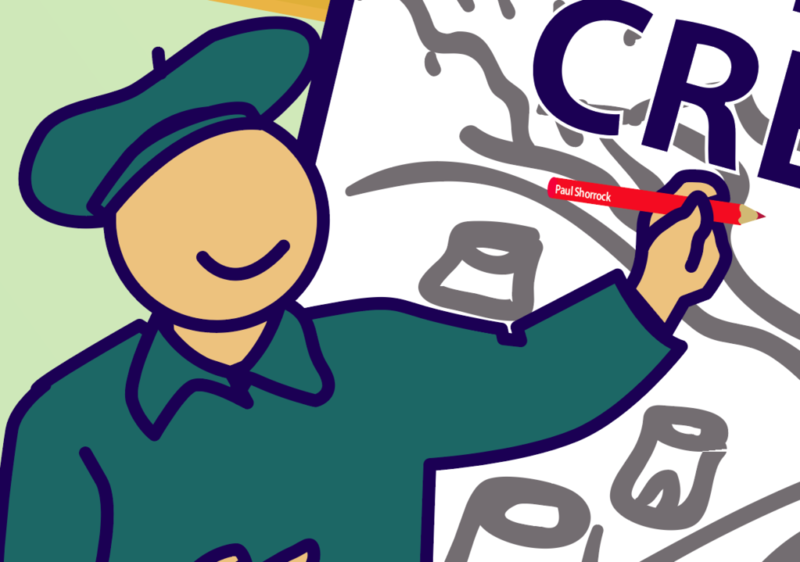 There is space for Bottom-up as well as Top-down communication. It allows everyone to have the birds eye view of the organisation. 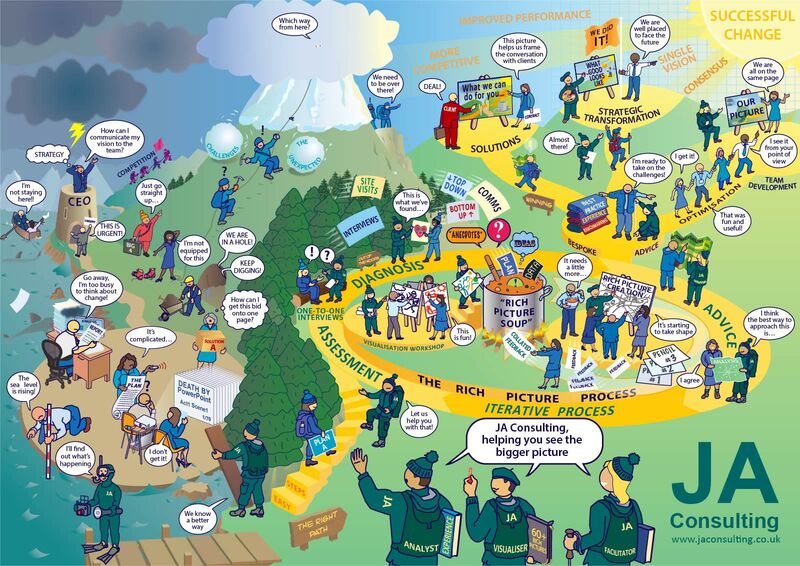 The actual physical and mental activity of a Visualisation Workshop can break down many barriers and force people to think in different ways and crucially have their voices heard. I have often said there is no single way to create a Rich Picture. It is a robust methodology with very little risk as the client is closely involved at every stage. At the first face-to-face meeting a huge amount of information is thrown at me in any format, written, spoken or visual. A visualisation workshop is not essential but it can have benefits in terms of buy-in and inclusivity and can sometimes suggest ideas that lead to the meta-metaphor. At the initial meeting I take copious notes, scribble small thumbnail sketches and keep an ear open for visual metaphors. People often say things like “Oh, I can’t draw!” then speak in a series of vivid visual metaphors such as “we feel like we are swimming in treacle”. Whatever it is, it all goes into the “Rich Picture Soup” and from that emerges a first pencil rough. This first draft may see half a dozen iterations before everyone is happy with the content. At each turn I receive a list of feedback that forms the basis for the revisions. I always aim to output the next pencil rough within twenty-four hours of receiving feedback. I like to keep the pace up and keep the project moving forwards. Ultimately the pace of the project depends on the client. One of the unsung benefits of the Rich Picture process is the degree to which it forces people to step outside their own worlds and look at the bigger picture. There are all sorts of collateral benefits in terms of breaking down inter-departmental barriers, getting everyone on the same page, agreeing universal truths. I talk about this aspect in more detail in an earlier Blog entry, Throw away the Rich Picture When it’s Finished. JA Consulting are rightfully proud of the ‘bespoke’ nature of their services. With a small team comes the advantage of personal relationships built up through face-to-face contact. 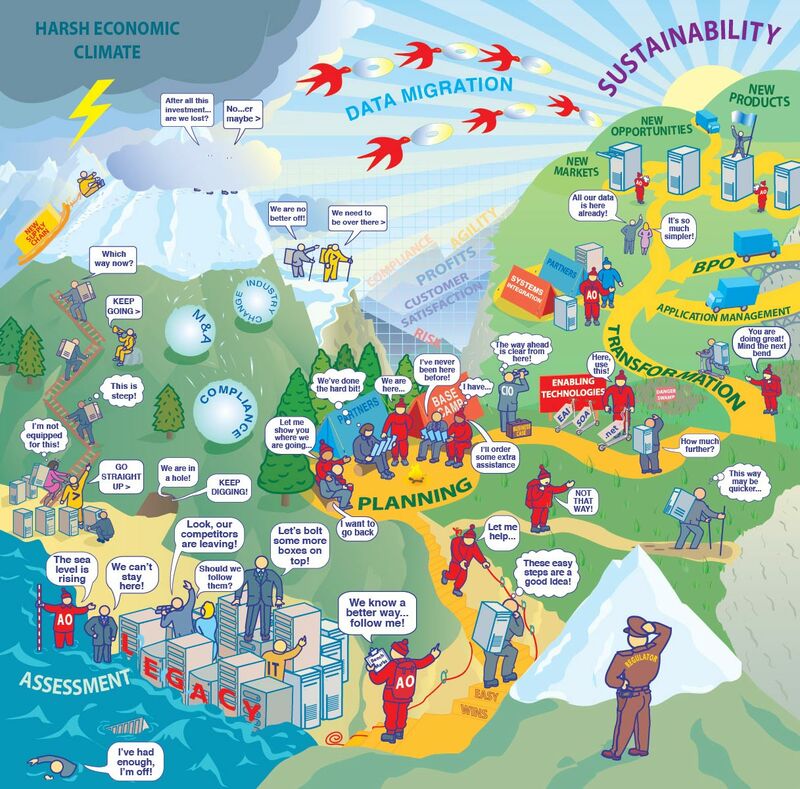 Years of experience and expertise in a wide range of industries and Government departments make them very useful potential partners to help you on the road towards the ‘sunlit uplands’ of successful change. They know the route like the back of their hands! If you tell them Paul sent you it might be the start of something great.